With a variety of spare and replacement parts, you can customise your work stations till you see fit. 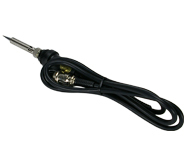 Aoyue C006A Replacement Desoldering Gun Heating Element. Suitable for the Aoyue B1003A Desoldering Gun.